I always like to experiment with my left over rice. First thing I always try is Fried Rice, Second thing on the list is Pulihora. Usually I make lemon version of Pulihora using Reallemon Juice, But When I saw this Big Pummelo ( right next to GrapeFurit as Sprouts) reminded me of Dabbakaya ( దబ్బకాయ / Indian Grapefruit) made me recollect the back at home days ( my child hood) when mom used to make Dabbakaya Pulihora (దబ్బకాయ పులిహోర) . Ahaa! Now I feel nostalgic. To conquer those feelings, I ended up buying that fruit to experiment in my kitchen. 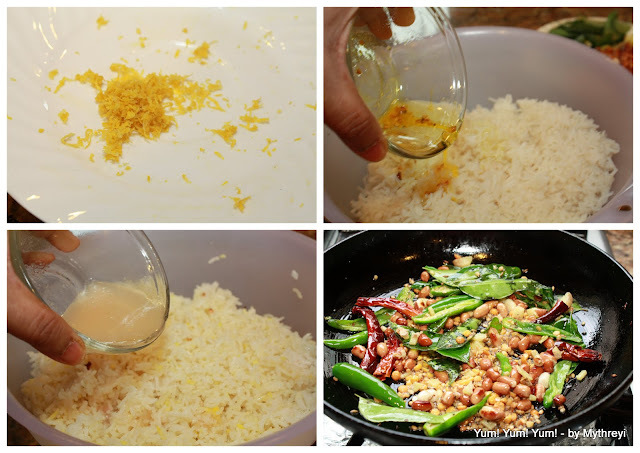 And surprisingly the result is delicious rice with light aroma of citrus and different from your routine lemon rice. Pumello got little sweet taste in addiiton to its sourness. That gives this rice very unique taste and flavorful. Another interesting recipe you can make with Dabbakaya(Indian Grapefruit) is Dabbakaya Pachadi (దబ్బకాయ పచ్చడి ) (Pickle) which looks close to Lemon Pickle Nimmakaya Pachadi (నిమ్మకాయ పచ్చడి ). 3. Add the salt to pumello juice and set aside. Based on the sourness adjust the salt measuring. 4. Spread your left over rice (or cooled cooked rice) in a bowl and add the pumello juice to rice. Based on your taste adjust the salt. 5. Heat 1 Tbsp of Oil and add turmeric powder to it. Add this to rice. 6. Heat the Nonstick pan with oil. Once the oil is hot ( to make tempering) add Red Chilies, Chana Dal, Urad dal, Mustard Seeds, Ginger Slices Curry Leaves, Green Chilies, roasted peanuts, cashew nuts ( add in the same order as listed). Once all the lentils start turning brown switch off the stove. 8. Add this to the rice and mix it well, followed by Tempering. 9. Mix everything well and Transfer to Platter and serve Hot. 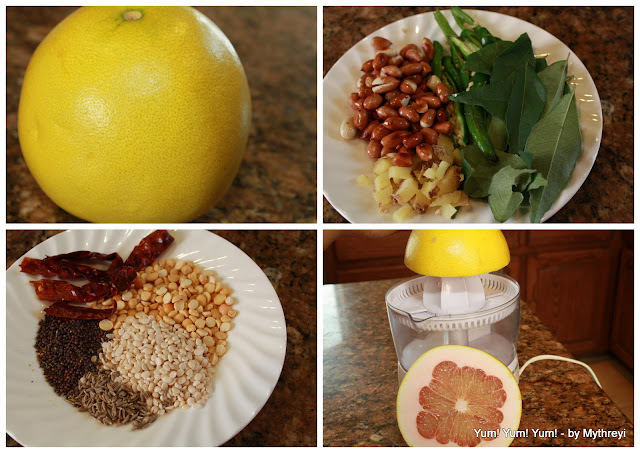 Some times the Juice may be very sour, always taste before adding to your rice. Pumello Zest gives the beautiful color and adds nice flavor to your rice. 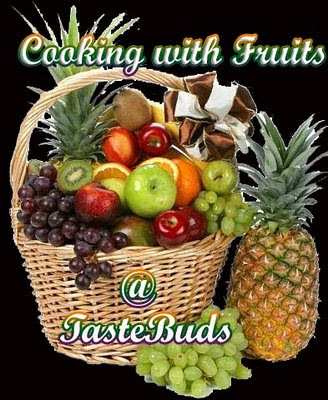 I am sending this to Cooking With Fruits Event at Taste Buds. Rice looks tangy and delicious. Liked the creative idea of using pemello fruit. Great pictorials n a very beautiful looking rice dish! !